"I am so thankful I go to a school where opportunities like this are available. As students, I think we all saw a glimpse of our future selves reflected in these talented, but humble actors." Actors from the Angelica tour of "Hamilton" made their Pittsburgh Playhouse debut hosting a Q&A with Conservatory of Performing Arts students January 10. "Hamilton" is on stage at the Benedum Center, located in the heart of Downtown Pittsburgh's Cultural District. "I am so thankful I go to a school where opportunities like this are available," said Caroline Bachman, a B.F.A. musical theatre major from Agoura High School in Agoura Hills, Calif. "As students, I think we all saw a glimpse of our future selves reflected in these talented, but humble actors." 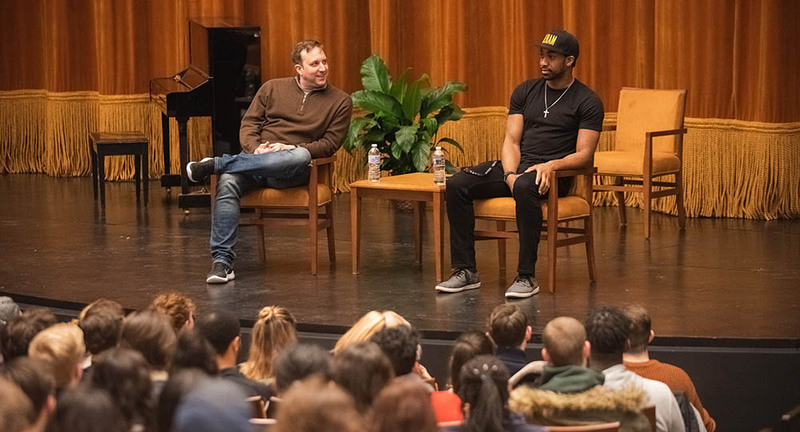 For nearly two hours, "Alexander Hamilton" – played by Edred Utomi – and "King George III" – who is Peter Matthew Smith, a former theatre major at Point Park University – highlighted their career paths, answered questions and offered useful tips to students. Additionally, they critiqued the performances of three musical theatre majors. "Hearing about the audition process from two people who have been in the room with some of the most influential people in contemporary musical theatre and have not only survived, but thrived, is extremely beneficial," said Emily Botnen, a B.F.A. musical theatre major from Roseville High School in Roseville, Calif.
Botnen added: "Their tips and tricks to not only stand out, but make a genuine connection in the audition room, have shown me what I need to work on to have a similar experience in my career." 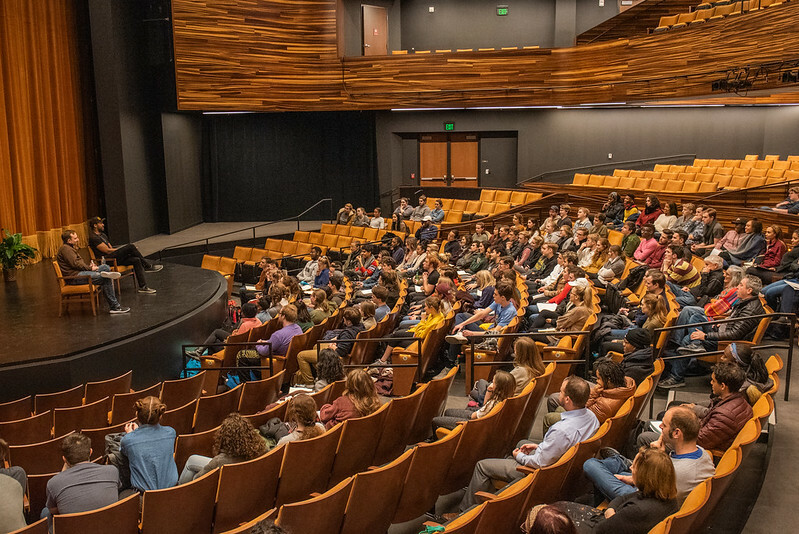 Point Park students were eager to ask questions about the audition process, how to balance personal life and work, how to adjust to changes in the industry, how performing on tour compares to taking the stage on Broadway, among others. "Take your phone into the audition room and record it so that you can play it back, listen to the notes and try to apply them." "Don't psyche yourself out for auditions. You will go to some you get and some you won't. Stay chill and push forward to your next opportunity." "Be yourself to stand out in an audition. Don't try to be Lin-Manuel Miranda or someone else. Focus on the clarity of intention for you through the text and you will stand out." "If you know ahead of time that the show you are in is coming to a close, start inviting casting agents to come see you. That's the best audition because you are on stage for them to see you." "Don't let your head get too big. We get to play for a living, so remember that and just play. Be grateful for every job you have as an actor." "You find ways to have a social life and enjoy things that make you happy. Often times, I'm backstage watching the Pittsburgh Steelers game on my iPad before I go on stage (you can find me sitting in the wings, dressed in full costume with my Terrible Towel). Keep doing things that make you happy as long as it doesn't sacrifice your work." "I'm now a character actor, when before I was playing more of the leading man. You have to learn how to adapt in your career and be comfortable with who is in the mirror." "When you get to my point in your career, you don't have to work as hard to land an audition for a show of this caliber. They bring you in because you will have credits, a strong resume and tools in your toolbox."